"This delightful reading of Kevin Henkes' book (HarperCollins, 1990) about sibling rivalry will please even the most reluctant new "big" brothers or sisters. Henkes' popular heroine, Lilly, is less than thrilled with baby brother Julius's arrival, competing for attention while her parents patiently direct her passive-aggressive anger toward more useful activities. Lilly surprises her audience, as well as herself, when she discovers the love for Julius that she's been hiding. Narrator Laura Hamilton's changes in inflection cleverly portray Lilly's harmless pranks and devilish sense of humor. Further drawing listeners into the text are minimal sound effects and appropriate musical interludes. Paired with Zac Morgan's song "The Cribling" (from When Bullfrogs Croak, Oct. 2003, p. 93), this title would make a wonderful addition to a "new sibling" story hour. An essential purchase for preschool and primary audio collections, it will be useful for emergent readers, group listening, and youngsters with new-siblingitis." "Lilly is the best big sister in the world--that is, until younger brother Julius actually arrives. Then Lilly is not so impressed. "If he were a number, he'd be zero" is how she puts it. Laura Hamilton does a good job with Henkes's astute story of the displaced older sibling, and her characterization of Lilly is appropriately edgy. Lilly isn't kidding around about the indignation she feels, and she uses the word "hate" liberally and with great vigor. But Hamilton's Lilly is also funny and entertaining, which is enough to keep some light in the story until the end, when Lilly experiences a change of heart." 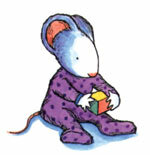 "Lilly, the spirited heroine of Lilly's Purple Plastic Purse (1995), made an earlier appearance in Henkes' 1990 picture book about the precocious Lilly's trouble with her baby brother. Lilly can't see that he is anything special -- just smelly and disgusting -- until one day a visiting cousin echoes Lilly's complaints, inspiring her change of heart. Narrator Hamilton is a superb storyteller, and young listeners will easily identify with the nasally tones she assigns to a very ornery Lilly. The text works well with the watercolor illustrations of Lilly, her parents, and, of course, Julius. The characters' voices and other sound effects help enliven the story. Spirited music plays at the beginning and end of the recording but not during the story itself, and page turn signals are included on one side of the cassette and one track of the CD."